I am glad to grant my Gold Award to you. You did a realy great job. Your site is wonderful designed and you give so much information about spiders to your visitors. It is for me a honor that I announce that your Award has won our "The best Graphic" Seal for the month of January 2009. Dear Tim you have done a very fine job in creating your award graphic. Congratulations, I have awarded you my Purple Moon Gold Award. I found Tim's Spider Corner fascinating in all aspects, also, you managed to dispel a few misconceptions about this underestimated, and sometimes feared creature. I for one, was enlightened more about the spider. TGood luck to you in all your future endeavours and thank you in allowing me to evaluate your site. Thank you for your application. Your application to Peace & Harmony Awards for a rating consideration your website has now been completed. Congratulations, we would like to grant you our Diamond Website Award with a score of 760 points. We hebben je website bekeken. Ik zie dat je echt veel werk van je website gemaakt hebt. Zowel inhoudelijk als het design. Het kost veel tijd en energie om je scripting foutloos te krijgen. Persoonlijke wil ik je echt mijn complimenten geven. Naast jouw website is jouw award programma echt een aanwinst tot de award community. Een awardprogramma van kwaliteit. Once again your site sets the standard of excellence! Your site was hand picked to receive one of our first Time Keeper Awards. Your site shows a high standard of quality which all site designers should strive to achieve. You have taken the time to make your site of interest to all, with an eye to detail and with an imaginitive mind. Your site surpasses our criteria in excellence. 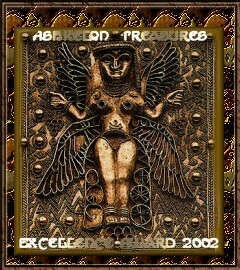 I am happy to be able to tell you, that you can add the Xam Project Award to your incredible collection of web awards. Your spider corner is the kind of website that every award master should love, because one can hardly find any faults or reasons to not give an award. what I liked the most was definitely the very, very nice navigation, which leads the user through the extremely detailed and well–readable contents. Danke für Dein Vertrauen und das ich Deine Seiten bewerten durfte! Es hat mir sehr viel Freude bereitet dort zu stöbern und das ich einwenig über Spinnen erfahren durfte. Dieses Thema ist wirklich außergewöhnlich aber ich habe festgestellt das auch dass ganz interessant ist. Für ganz Informativ halte ich die Beschreibungen über den Wachstumsaufbau der Spinnen. Ich finde es schön das Du Deinen Wissen über diese Krabbeltiere den Liebhabern zu Verfügung stellst. Die Vorstellung der Literaturen in welchen man allerlei Infos holen kann, präsentiertst Du schön. Auch die Bilder über die verschiedenen Spinnenarten sind sehr lehrreich. Du hast ein sehr schönes Design gezaubert und man findet sich gut zurecht auf Deinen Seiten. Ganz besonders hat mir die kleine Spinne im Hintergrund der Buttons gefallen. Zu guter letzt möchte ich noch Dein Awardprogramm erwähnen dass Du gekonnt führst und die Bewerberseiten mit ganz tollen Awardgrafiken auszeichnest. Ich möchte Dir ein großes Kompliment aussprechen für diese hervorragende Darstellung Deiner Seiten und dem Informativen Inhalt. Lieber Tim, ich freue mich das ich Dir heute den Traum Bilder Award in Gold übereichen darf. Deine Seiten haben diese Auszeichnung verdient! Ich wünsche Dir noch ganz viel Erfolg und noch sehr viel Spass mit Deinem Hobby "den Spinnen"
I have been very pleased about your application. Your home page already represents something special on the Internet. The main topic deals with the bird spiders, worked with an unmistakable design very cleanly. You work to establish calmer relations to these fascinating animals with this page one by the much information, the photos and videos. Simply remarkable. As you also write, the desire then arises to keep even spiders in a Terrarium. With the fullness to information your side is an runing point for all spiders interested. One of the best Awardprogramme rounds off your offer. For your excellent work I present you the Palion–Award with the ID.13.02.TB and the Palion Design Award for the neat graphic, very much this one supports the chosen topics. She is something quite special in the Internet. Agreing with all good wishes. I'd like to thank you for a site well put together. I have completed the process of reviewing and evaluating your site. I'm pleased to say that your site has been accepted for my Panzys Award. Du hast uns in Dein Reich der Spinnen eingeladen und wir sind dieser Einladung gefolgt. Hier auf diesen Seiten möchtest Du uns die Spinnen näher bringen und das ist Dir gelungen. Das Beispiel mit der Spinne und der Fliege hat mich sehr beeindruckt; sagt es doch die Wahrheit über diese wunderbaren und nützlichen Tiere. Deine Page klärt uns über Lügen auf, zeigt uns die Fakten und Anatomie der Spinnen und über Buchtipps und sehr schönen Bildern haben wir auch noch sehr viel Spaß gefunden. Dein Ideenreichtum und Deine grafischen Meisterleistungen haben hier eine wunderschöne Homepage entstehen lassen. Mit Deinem hervorragenden Awardprogramm hast Du Deinen Spinnen ein sehr schönes Denkmal gesetzt. Wir sind stolz diese Seiten bewerten zu dürfen und möchten Dir den A&A Award Exquisite überreichen. Wir wünschen Dir alles Gute und noch viele Besucher auf dieser exzellenten Homepage. The site is well enough structured, it's ease to read and to surf. The graphic is clean, well done and well used. The contents have been deepened and disposed in a good way. The Awards Program is complete, well structured and with a clear purpose too. We have been pleased to find some extra meterial in your Awards Program. Your website, Tim's Spider Corner, won the Gold Lupe's Award, congratulations! I am very impressed with the beautiful design, the very interesting content and the extremely easy navigation, well done! I am very pleased to announce that I have completed my evaluation of Tim's Spider corner and found it to be very interesting, informative and noteworthy. Your all–over design and navigation is impeccable, and have obviously devoted much of your time. With the highly successful score of 100/100, I would like to present you with my Silent Tears Gold Award. I had no idea that these creatures date back as far as the dinosaurs! Over a million years ago! a long, long time ago you've applied for one of my El Fabi Awards. 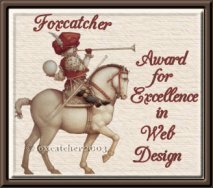 It's been a while, admittedly, but now I finally had the time to visit your website in my 'profession' as award master and give it a closer look. I've completed my visit I'm happy that I can announce I've decided to award your project with the El Fabi Award Falcon of Honor, Serial F4/05, the fourth award of this class to be released in this year. 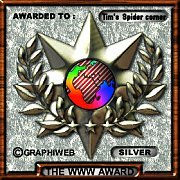 It is with great honor that we announce that your Tim's Spider Award image has won our prestigious award; the "Best Award Graphic" Award for the month of June 2005. Dear Tim, you have done a superior job in creating your award graphic and it is quite obvious that you have spent a lot of time developing your wonderful masterpiece that is pleasing to the eye and a pleasure to view. Congratulations, you are a winner of one of my Golden web awards! Your site is very well done. I found your layout very well put together and the content very interesting. Great information and lots to see. Thank you for allowing me the opportunity to review your site for an award. After carefully reviewing your site, we would like to honor you with ProFish–n–Sea's World Class Website Award for surpassing our criteria of excellence in concept, design, layout, rich content and easy navigation. After carefully reviewing your site, we would like to honor you with Kuuloa Kai's Top Site Award for surpassing our criteria of excellence in concept, design, layout, rich content and easy navigation. Your site has an awesome layout, and the information it carries is exceptional. I learned a bit more about Bird Eaters (what we call them in Oz), and I loved your movie's, and also your jig saw puzzle. That should come with a warning about how addictive it is! Again, congrats, and well done! Your site, www.timart.be, has been awarded the Family Safe Award from ContentWatch. I'm sure you've heard it many times before, but your site is incredible. I have never seen so many pictures and information about spiders as you have on your site. Your passion is inspiring. You are being given the award because your site met the high standards required by ContentWatch. I am confident that by posting this award on your website you will reassure visitors of your site's high quality and commitment to provide a family safe website. 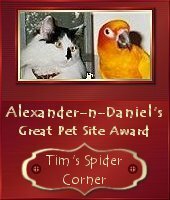 The Alexander–n–Daniel Great Pet Site Award is a little (non–rated) award we are now giving out to our favorite Pet sites ... to earn this award, your site shows us that you dearly love our furry/fluffy/feathered friends, and that you celebrate their love for us!! .... I hope you will accept this little token of our appreciation for creating such a wonderful Pet site! You have just won one of Lindor's Awards! The EXTRA GOLD one! Thank you for submitting for the Lindor's Award! Thank you for the invitation to judge your homepage, it's very interesting. The described spider species, which many humans scared and do not know at all. The design is much attractive, likewise your Awards. With 100 possible points I hand over the EFW–Homepage Award Super to you and wish you many visitors. Congratulations and greetings from Vienna. I'd like to thank you for a site well put together. I have completed the process of viewing and evaluating your site. I'm pleased to say that your site has been accepted for my Silver Award. Barrettsnet is happy to say that your site has gained the Barrettsnet Silver Award for its design. Well Done!! Your site has being added to our silver awards winners list. Dream Weaver's Awards is pleased to annouce your site has been reviewed and you have won our Gold Award of Excellence. As a Gold Award winner your site may be featured in our Newsletter in the near future. The sites are judged on content, functionality, graphics and usefulness to the general public. We spend a lot of time reviewing sites and not all make the grade. You have done a great job, keep up the good work! Your Web site has been selected to win a Web Works Site Award. I have chosen your site, to be a worthy of our Designs Award. It is to signify that your site has been judged to contain quality content, design and/or HTML expertise. Tim's Spider Corner is exceptionally well designed and informative and is one of the more user friendly sites online. It is an excellent resource for learning about the care, anatomy and behavior of spiders... great for pet care! Tim's Spider Corner is a fine example of the spirit Blair's Equine Awareness is promoting... the ethical and humane care and treatment of animals... Well done! Congratulations from all the staff at Art Space 2000.com. You have won the Gold Medal Web Award of Excellence for originality, overall design and appearance, ease of navigation, and content. Keep up the good work. I enjoyed my visit to your website very very much! Attached please find our GOLD Award! Thanks for applying for our award! We have visited your website http://www.timart.be and really appreciate your helping make the Web a more interesting, useful and attractive place to visit. CONGRATULATIONS, we are pleased to give you the link to receive our award! It is with great pride that we announce that your web site is a winner of our RunWeb–Awards Program : Silver Award. Thank you for informing me about Tim's Spider Corner. After an extensive review of your site, we find that it merits The Mona Lisa Select Sited Award for its aesthetic design, informative content and navigation. The wide variety of information is presented in a well organized manner and quite suited for information gathering and research activities. As a result, your site is being featured as our selected Site of the Month for July 2004. Congratulations! Your web site Tim's Spider corner has won the WowWowWow Silver Award! We found it particularly interesting for its Design and its informative Contents. We enjoyed visiting your site, and we thank you for this very good contribution to the Web. Again congratulations, and we wish you much of success with your Web site! You have won my Award based on the ease of navigation, content, graphic quality and design of your site. Your site is well done, a lot of information about spiders, and the design is quite nice too! Well, I think that all together is worth an Silver CliX Award! Thank you so much for applying for one of my awards, I would be honored if you would accept it for your site. I'm pleased to say that your site is well deserving of our Talented Webmaster Award. I can tell you spent a lot of time to make your site interesting for your site visitors. You'll be added to the list of Official Award Winners. Congratulations! Congratulations! 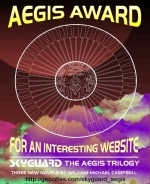 You have the won the coveted and highly-sought-after Aegis Award for an Interesting Web Site! Once again, congratulations, and thank you for applying. We know how much work and dedication that has went into this great web site that you have built and we are pleased to inform you that we have found your site to be among the best on the Internet and hereby award you with the DesignFirms.org Web Design Award! You really do have a great site and I enjoyed my visit very much. It was a pleasure to see you did a lot of work on your site: great content, fine lay out, beautiful graphics, you sure do deserve an award for this incredible job!! Hello and thank you for applying for my awards, you have a wonderful site and here is the award. Your site , Tim's Spider corner, has been selected to receive the Quality Check Award 'GOLD' Award. We see all the hard work and dedication that you have put into constructing your web site and your efforts are well deserved. Your site displays Excellent Design and Layout of Website, with quality content and information for your visitors. Your site is a useful contribution to the Internet Community. also I'm not really a fan of spiders, I was really impressed when I've visited Your website. You provide excellent information about spiders and You present this information together with good photographs and mpeg's. Also You award–program is one of the better in the net. It's therefore a pleasure for me to present You today the Info–Award from the museum. I have been able to take the time to peruse your site and while I'm sorry to say spiders are not one of my most favorite things on this planet I do think your site is well planned out and easily navigable. Most pleasant to the eye therefore I hope you will accept the attached award in the spirit in which it is offered. I did not send the requested award because I truly believe you have underestimated your talent! Thank you for submitting for the Neovizion Award. We enjoyed viewing your website. 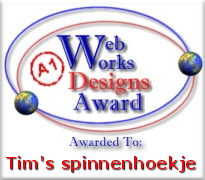 It is with deepest pleasure I announce that your website Tim's Spider Corner is a winner of Eminent Choice Web Award. I have enjoyed every minute I have spent on your site. Your website is giving an excellent first impression. The design is uniform and giving a calm and solid feeling the entire site through. The navigation is flowing and keeps the visitor on track all the time. It is very hard to get lost on this site! The choice of colors and fonts is really good and makes the site easy to see, read and understand. The content is interesting and educational and presented in an appealing way. All the photos are of very high quality and very interesting to look at. The choice of xhtml for the coding is showing that you are keeping up to date with current web standards and recommendations. Congratulation to a very well built resource site. Tim's Spider Corner is really an eminent choice for all surfers on the world wide web. I wish you all possible success with the site and your spiders in the future. Congratulations, after careful consideration, the design staff at Triumph PC are pleased to announce that your site has won the 2003 "Award of Triumph" Website design competition for good overall design and execution. You should consider this both a great honour and a testament to your good taste and superior webdesign skills. Deine Seite enthält sehr viele Informationen, trotzdem hast Du es schafft, die Informationen ordentlich und sauber unterzubringen. Die Texte sind klar gegliedert und auch für Laien verständlich geschrieben. Das Layout ist außergewöhnlich und sehr kreativ aber stets zum Thema passend. Die Navigation läßt eine einfache Handhabe zu. Wir sind stolz darauf, Deine Seite mit unserem Award auszeichnen zu dürfen. Weiterhin wünschen wir Dir viele Besucher und einen guten Erfolg mit Deiner Seite. Your site is very good, so here is the award. We are happy to inform you that your site has been awarded our Silver Award. Congratulations! PLC Web Design Silver Award Winner! 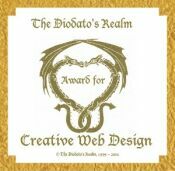 I have great pleasure in awarding your site THE SILENT STUDIOS LAST SUPPER WEB DESIGN AWARD. Your graphics are good, pictures are excellent, and content is well presented. I do not profess to know anything about spiders, but I found your site interesting and informative. Well done. Overall, gathering a score percentage of 80%. I am pleased to inform you that your site won my silver–bronze award: "HANDS OF MERIT AWARD". Congratulations! My awards are not easy to win! This just proves that your site has that x–factor and appeal that true visionaries of the web have, innate in themselves to creatively channel it through their sites! My respect! You deserve it! 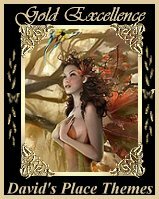 I wish you good luck on all of your endeavors, as well as all the divine inspirations to aid you in your next creative–expression! May you give us the opportunity to view and evaluate your next masterpiece again! The Scoobies.de Gold Award goes to you and your website! Congratulations, well done! I'm enclosing the Award for your Page! You have a great Site and you're nominated for the 2004 Homepage Award in December 2004. What an absolout pleasure it was to be asked to evaluate your website. Informative with ease of navigation and tastefull colours. A site that trully deserves to display my Gold award. My sincere congatualtions on producing a gem of a site for the W.W.W. You have won a webthrower.com Silver Award... Congratulations!!! After viewing your site, I can see the hard work you put into it and you met all of my criteria to win the Silver Award with a high score of 80. I am glad to give you the recognition that you deserve. I wish you much success in your endeavors. It is with great pleasure that we inform you that your website has been chosen to receive the Astral Peer Award. 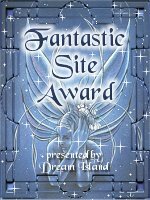 Thank you for submitting your website to Artsyawards.com and congratulations. Your website received a bronze award. 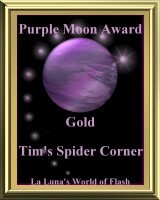 Tim's Spider corner has been reviewed and chosen to bear the 2003-2004 Golden Web Award. 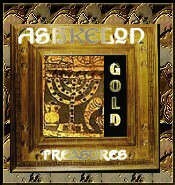 We have visited your wonderful website recently and would like to present you with the Ashkelon Award for your hard work. Your site has won the Vpportal Animated Award of Excellence. We believe your site would be an asset to our Top sites. Thank you. You are one of Gunners' Winners! Very clean navigation , and easy on the senses. I Award you Gunners' Silver. Thank you for submitting for the Neovizion Award. You have won the Bronze Award! 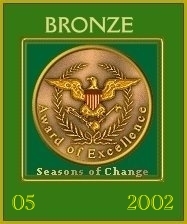 Your site as listed above has been chosen as a winner of The Seasons of Change Bronze Award for May 2002. I enjoyed my visit to your site. Thanks for making the web a better place. It is evident that you have put a lot of hard work into your web space. Congratulations you have been awarded the "World Web Award of Excellence". Your site meets all of our qualifications that makes for a great site. We enjoyed our visit to your site, keep up the good work. We have visited and reviewed your site. Please accept the attached bronze award to be proudly displayed on your site. Thank you for your submission to our awards program. Your Web site has been selected to win a Web Works Site Award. I have chosen your site, to be a worthy of our "Designs Award". I have viewed your site and find the layout and content very nice, and easy to navigate. You have achieved the Silver status. Keep up the wonderful work. Thank you for applying for our site award, we have reviewed your site and are very pleased to award you our Gold Award. Very nice site keep up the good work. We were very impressed by all the hard work you have put into your web site. We found it to be excellent, very well designed in both the layout and its content. 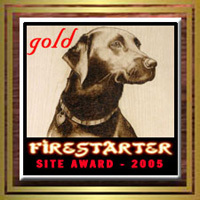 It is our honor to award you our "GOLD"
I do know a good quality site when I see one. Much continued success to you. Congratulations VPAD Award!!! After viewing your site, we can see the hard work you put into it. Thank you for sharing it with all of us.